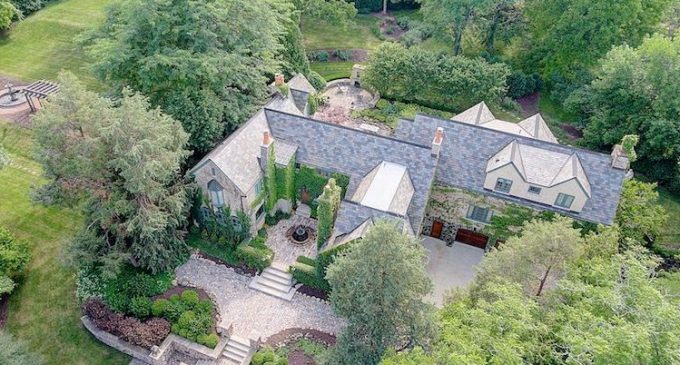 One of Elm Grove, Illinois’ finest historic homes is on the market for $2,775,000. The lovely 10,300 square foot English Tudor manor sits on over three park-like acres with superb period-style architectural features, including extensive stonework, hand-carved mantels, gleaming hardwood floors, decorative custom ironwork, leaded glass casement windows, a slate roof and stunning period lighting. Gracious and inviting layout includes a walnut panelled dining room, library, four season porch along with four fireplaces and a meticulous 2006 west wing expansion including a family & media room, additional guest bedrooms, mud room and more. There are six bedrooms and five bathrooms throughout. Multiple doors open to stone patios, outdoor fireplace, fountain, wonderful arbors and beautifully landscaped gardens. The home is on the market for $2,775,000 with Andrea Woda.